Edutopia covered that study last year, and we’ve shared many other ideas from teachers for ensuring that every student in the classroom feels like they belong. Some of the activities below take less than five minutes. They’re divided up among the grades, but many can apply across all of the years from kindergarten to 12th grade. Shout-Outs: This is a quick way for students to celebrate each other for doing a job well or for attempting something difficult. Shout-outs can be incorporated at any point in a class. First-grade teacher Valerie Gallagher of Providence, Rhode Island, rings a chime when she wants to get the class’s attention to ask who has a shout-out. “It’s not just me as the teacher saying, ‘You’re doing well’—it’s a way for them to interact with each other and celebrate positivity,” says Gallagher. Friendly Fridays: Elizabeth Peterson, a fourth-grade teacher in Amesbury, Massachusetts, uses Friendly Fridays as a simple way for students to lift each other and themselves up. Peterson has her students write a friendly, anonymous note to a classmate, practice using positive self-talk, or use storytelling to give a peer a pep talk. Sharing Acts of Kindness: Fifth-grade teacher Marissa King, of Tulsa, Oklahoma, shares two activities that encourage kindness. In the first, the teacher gives students secret kindness instructions, such as writing an anonymous note to a peer who is struggling in one of their classes. The second activity revolves around noticing others’ acts of kindness: When a student sees a peer tidying up in the classroom, for example, they can post a thank you note on a shared digital “kindness wall.” Both activities coach students to be kind to their peers in the hope that they’ll begin to practice kindness unprompted. 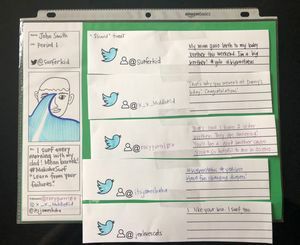 Paper Tweets: To build community in her seventh-grade classroom, Jill Fletcher of Kapolei Middle School in Kapolei, Hawaii, created a bulletin board modeled on Twitter. Students use a template to create a profile, and they enlist at least three followers—a friend, an acquaintance, and someone they don’t interact with much. When the class does this activity—which takes about 45 minutes to set up the first time—Fletcher has them respond to prompts about their current mood or new things happening in their lives, and then their followers respond. Class Norms: Bobby Shaddox, a seventh-grade social studies teacher at King Middle School in Portland, Maine, has his students develop a set of norms for themselves—adjectives that describe them as a community of learners. Having students come up with their own norms creates “a pathway toward belonging for every single student in that class,” says Dr. Pamela Cantor, founder of Turnaround for Children. Group Salutes: A moment shared between two or more students at the beginning or end of an activity, a Group Salute is a teacher-prompted interaction that is a quick, low-prep way to cultivate community. The shared gesture can be physical—like a high five—or social—a teacher could ask students to express gratitude to their group members. There’s some interesting data supporting this idea: Researchers found that NBA teams whose players touch the most early in the season—high fives, fist bumps, etc.—had the best records later for the season. Morning Meetings: Morning meetings have long been a staple of elementary classrooms, but they can help students in all grades transition into class. Riverside School, a pre-K to 12th-grade school in Ahmedabad, India, uses a version of morning meetings at every grade level as “a pure relationship-building time.” Bonding exercises led by teachers or students include physical or social and emotional activities, or discussions of sensitive topics like bullying. Appreciation, Apology, Aha: As a quick, daily closing activity, students gather in a circle and share an appreciation of one of their peers, an apology, or a light bulb moment. The teacher models the activity by sharing and then asks for volunteers to speak. “Those types of appreciations and community recognitions can go a long way toward building bonds,” explains Aukeem Ballard, an educator with Summit Public Schools in the San Francisco Bay Area. Rose and Thorn: At the start of class, the teacher and students take turns sharing one rose (something positive) and one thorn (something negative) each. The process takes about five minutes. “A low-stakes thorn might be ‘I feel tired.’ Yet many students choose to share more personal items, like ‘My thorn is that my dog is sick and I’m really worried about her,’” writes Alex Shevrin Venet, a former school leader at a trauma-informed high school. Snowball Toss: Students anonymously write down one of their stressors on a piece of paper, crumple it up, gather in a circle, and throw their paper balls in a mock snowball fight. When that’s done, they pick up a snowball and read it aloud. “The idea is that we’re moving around. We’re able to have fun, laugh, scream, be loud, and then have that discussion about stress,” says Marcus Moore, an advisory leader at Urban Prep School in Chicago.